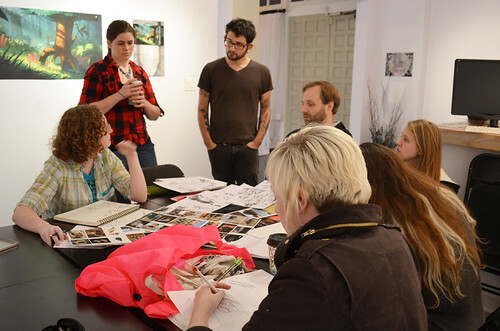 World Building Workshop With Claire Hummel and Colin Foran- Weekend Recap! Wow! 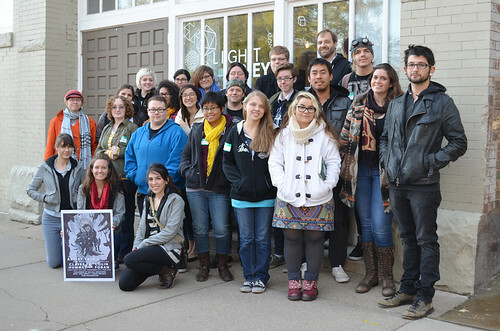 Well, we just got done with a fantastic and exhilarating weekend here at Light Grey Art Lab! 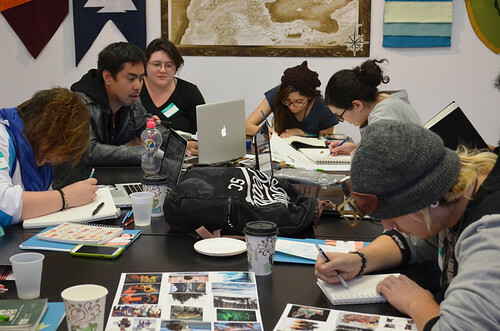 We had the honor of inviting Claire Hummel and Colin Foran from Microsoft Studios to teach a three-day intensive studio workshop filled with world building, brainstorming, and critical conversation! 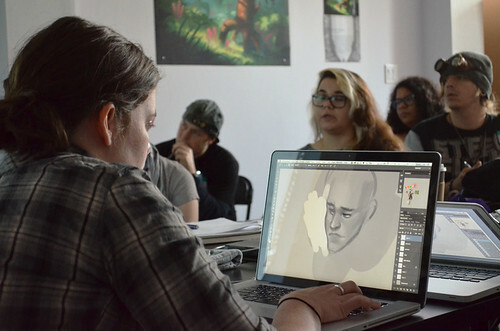 Overall, the weekend was an informative and challenging introduction into concept art and the gaming industry, with expert advice in promoting yourself, working on a production team, working practice, and portfolio tips, as well as tons of studio time for the participants to build and develop worlds of their own! 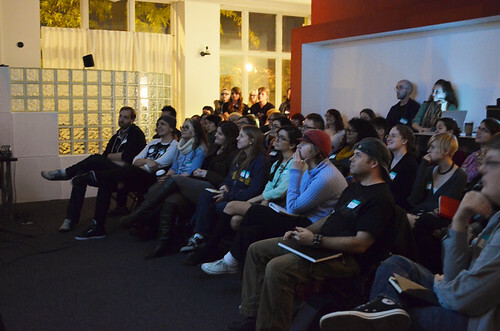 The weekend began with a free public lecture here at Light Grey, where Claire and Colin were able to share and talk about their past, current, and in process projects for Microsoft Studios. They described their pre and post production work and talk a little about the industry, collaboration, and the art of concepting. It was wonderful to see and celebrate all of their work! 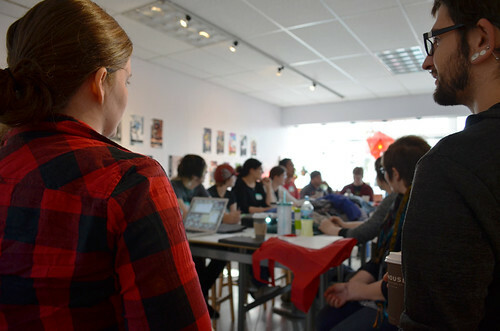 We had a packed house full of students and creatives from around the community who were eager to hear about their process and meet Claire and Colin in person! 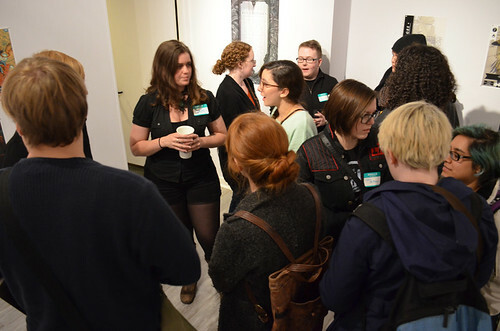 Immediately following the artist talk, was our All Creatives Meet & Greet! Tons of local creatives, traveling artists, students, and neighbors stopped by for a chance to say hello, exchange business cards, and talk about their work- such an energetic and fun evening! Saturday morning began with a large pot of coffee, tea, and bagels as we settled in for an ambitious weekend. 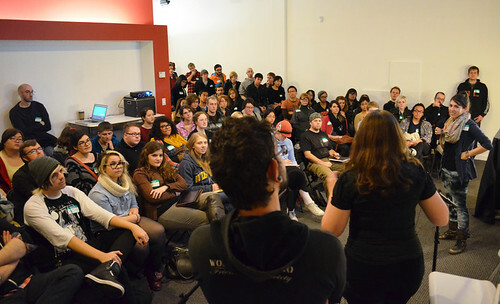 During this time, all of the participants were able to introduce themselves, their objectives, and backgrounds. Then, Claire and Colin gave an in-depth presentation of their background, where they came from creatively, and influences along the way. They both come from a rich background of freelance illustration, digital and traditional mediums, concept art, and art direction- all informing what they do today. 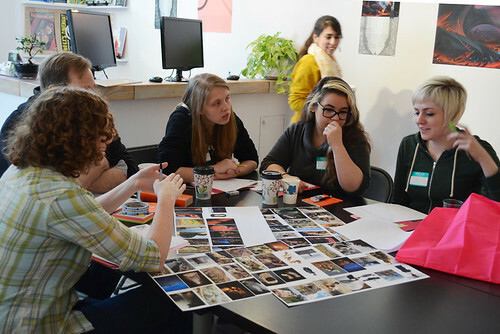 The morning presentation of world building concepts was a great way to kick off the workshop! 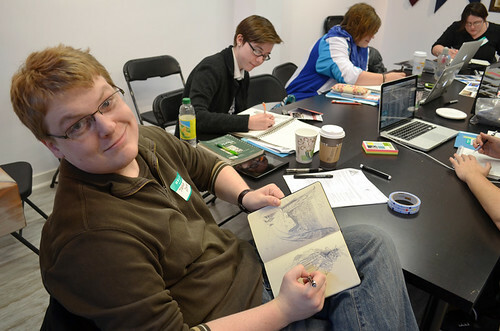 Students were ignited, full of ideas, and ready to start sketching! Students grouped with their teams to begin researching and rapid brainstorming for developing new worlds! 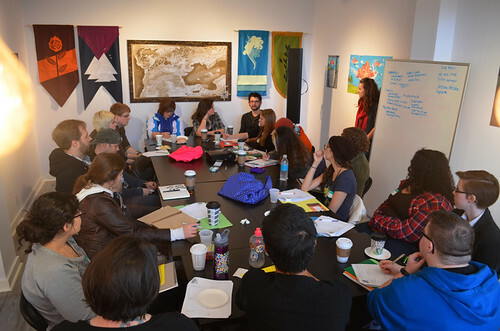 A giant, collaborative ideating session which took us to on a journey through high functioning societies, underground dwellers, decorative and magical people, and refugee island inhabitants. All ideas were put on the table! 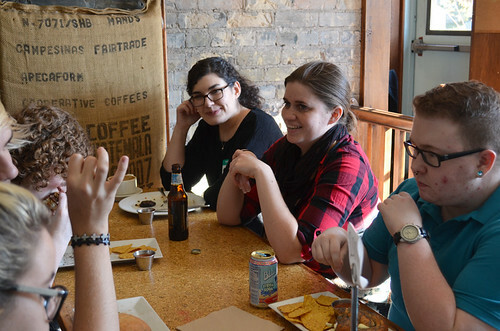 After the first studio session, we made our way to Common Roots Cafe for a lunch break. It was definitely time for brain food! 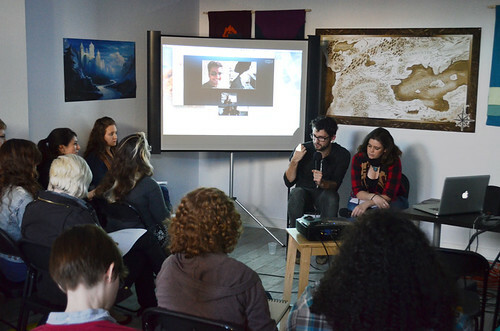 After our break, Claire, Colin, and our two guest artists, Victor Mosquera and Sidharth Chaturvedi, joined us for a skype interview and Q & A. 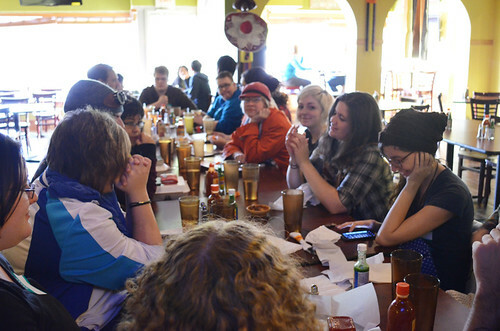 All of these artists work in the concept art industry, but with various specialities and kinds of games/concepts. This was a chance to compare and contrast mobile games verses video production, and illustration- it was a chance to ask the tough questions about pace, expectations, and standards. The conversation was eye opening for all of us! Colin is definitely a master of his craft! 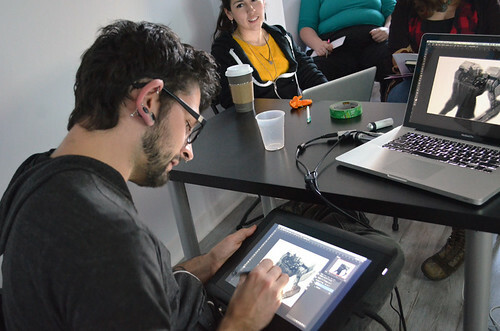 During his digital demonstration, we watched in awe as he developed one of his robot sketches. It quickly went from a rough sketch to a well-lit, colorful, and believable image. He made a point to emphasized the importance of knowing your materials- the visual differences between types of metals and leathers and how to render them. Wow! For the afternoon, it was back to world building! The morning studio session got us off to a great start in defining our kingdoms, and now it was time to solidify ideas and concepts. This session was all about research, combining ideas, and challenging others. Students worked right alongside Claire and Colin to lay out the ways of their lands. At the end of the first day, we transitioned from world builders for our Boardgames, Beer, and Pizza Night! 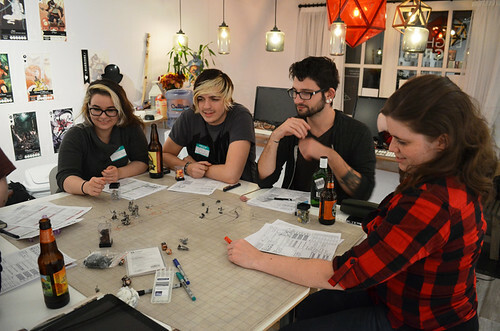 Players joined in to learn Rolemodels: The Battle For Vyk'Tornaahl, D & D, Tarot Readings, Labyrinth, and other awesome games. It was a fun, competitive and nerdy night! Here we are- in the midst of an epic quest! Sunday began with breakfast and business. Claire and Colin led a roundtable discussion about conventions, portfolio building, and the business side of the gaming industry. It is always useful to hear first hand experience of what to expect in portfolios, what to include on your website, media resources, and more. The workshop participants had tons to share on social media and resource topics! The, Claire led a digital demo on developing characters. She is fantastic person to share information about research in characters, constructing costumes, and personality! I think everyone was blown away by her attention to detail and intricate line work! After a few hours of concepting time for our lands, we headed off to lunch! This was a chance to catch up with the other teams, exchange ideas, and relax! For the final working session of the day, we got right to work! It was about putting ideas to paper, being able to present on our ideas, make a case and logic for the ways of the land, finishing thoughts, and critique. Each group did a great job of representing many parts of their world. By the end of the weekend they had a goods understanding of developing an entire world, all the parts, and considerations that go into it. Students had interesting cultural garbs, city centers, good, food, and weapons for trading at the market, and more! It was impressive and thoughtful work! And here is the whole group! A fantastic group of creators! 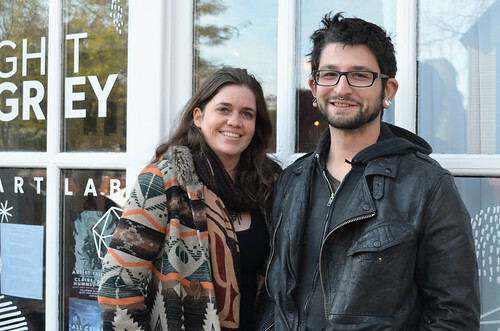 You can see more artwork and information about Claire Hummel and Colin Foran here. You can also see the entire collection of photos from the weekend on our Light Grey Flickr Page here.